Rick Riordan is an amazing author. Never heard of him? He primarily writes for kids, his popular series being the Percy Jackson series and the Kane Chronicles. But seriously? You should read them. He does a phenomenal job at creating a compelling, adventurous, suspenseful storyline. I guess I should start by telling you where exactly this book is in the series. 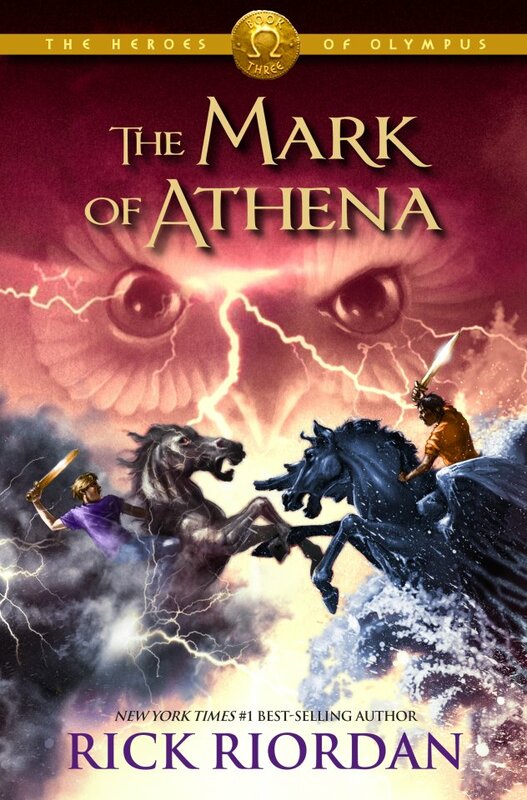 Well, Mark of Athena is the third book in the sister series of Percy Jackson…so you can almost think of it as being the 8th book in the series. I know, I know, that’s a lot of books, but I swear you will be able to finish them so fast! I also love Greek (and Roman) mythology. Riordan puts his own twist on the gods and goddesses, and it is truly spectacular how he portrays them in 21st century. I always loved reading myths growing up, but, reading this, I have realized how many I have forgotten. He references so many myths and lesser gods or goddesses that I have forgotten. For example, in this book we ran into Echo and Narcissus. I had completely forgot that story! However, as soon as I started reading through it, I remembered what happened. It’s actually hard for me to say anything more about this book without giving things away. Basically, and this is definitely the most basic I can say this, a group of demi-gods are chosen to go on a quest. They are up against bigger and stronger villains, and they have to use their unique talents to prevail. I liked how the group of demi-gods have to work together…they are uncomfortable with this, but it is nice to watch (I guess, read) them overcome this obstacle because the only way they would have succeeded was through each other’s help. With that being said, I am not happy with the ending…Riordan does a wonderful, wonderful, wonderful job with cliff hangers. All of his books read like one story. There is no time in between them, every ending leads right into the beginning of the next book. It is absolute torture to have to wait for the next book to come out. Anyway, I know this isn’t very descriptive, but it is a wonderful series that you should check out! HAHAHA, why yes, yes I have. Being corrected now! PS did you get a wordpress!? no, not yet anyway. i was just so concerned i felt the need to comment lol.